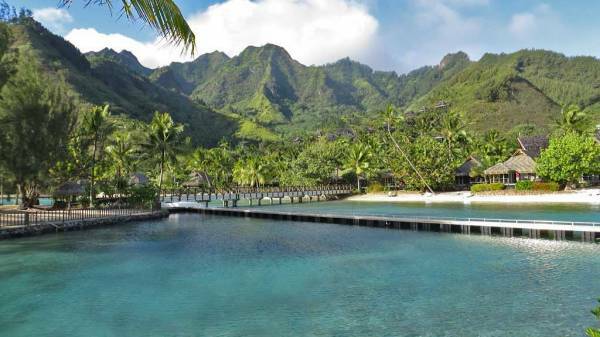 We enjoyed our stay at the InterContinental Moorea Resort & Spa immensely. Torea Nui Tours shuttled us to the hotel from the ferry landing. 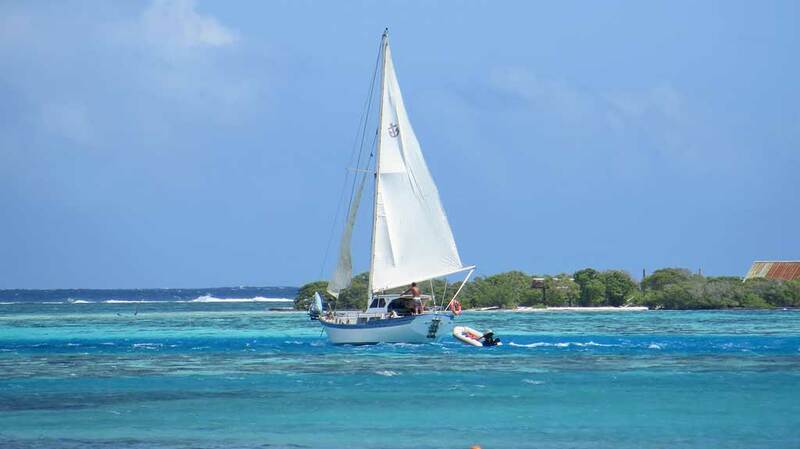 Moorea Tours also provides shuttle service. The hotel is at the northwest corner of the island, past Cook’s Bay and past the Hilton. 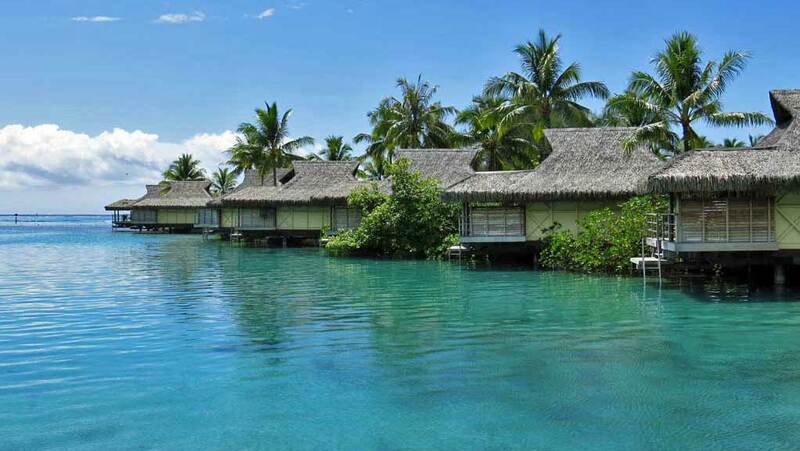 The InterContinental Moorea overwater bungalows are simply fabulous! The bugalows are very large and have a luxurious feel. They have king beds, oversized bathtub, couch, satellite TV and a large deck. The bathroom doesn’t have a door and the shower isn’t enclosed, which is a great feature. The deck is large enough for a table, two chairs and two lounge chairs. There is a freshwater shower on the deck and a ladder straight into the ocean. 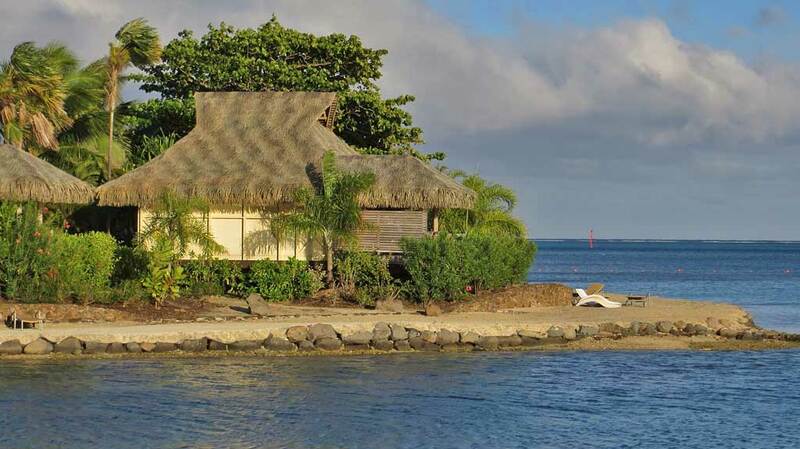 Without the overwater bungalow, the visit would not have been such as wonderful experience. The overwater bungalows are all connected by a short bridge and in the middle is the dolphin center. The center was popular, but we didn’t participate, because it just feels wrong to see these animals in captivity. The Dolphin Center is presented as a research facility, but it’s really a revenue generating tourist attraction that even has a speed dial for it on your room phone. The overwater bungalows on the outside have much deeper water and larger tropical fish. Several people said they had reef sharks swim under their balcony when it was feeding time at the Dolphin Center. The overwater bungalows on the inside have smaller fish and some beautiful sections of coral teaming with fish. During our stay we saw coris, chromis, triggers, brown clownfish, damsels, squirrelfish, bright blue parrotfish, an eagle ray, numerous varieties of butterfly fish and lots of Picasso triggers. The Picasso triggers must have been in mating season, as they faked attacks at me in a very convincingly scary manner. The snorkeling was excellent and occupied most of my time. The main hotel building isn’t as impressive as the InterContinental Tahiti. It’s set lower down and doesn’t have the expansive views that the hotel in Tahiti does. That takes away from the ambience greatly. The dining staff lacked some of the flamboyance that the male waiters at the InterContinental Tahiti entertained us with, but all staff were extremely friendly. The meals were slightly more expensive on Moorea. It’s expensive everywhere in French Polynesia, as nearly all the food is imported from places like New Zealand. A hamburger and fries were $22 US here vs $19.50 in Tahiti. Bottled water was $5 for a half liter. Some of the meals were great and some weren’t. We enjoyed samosas and pizza fenua (tuna pizza), but didn’t care for the chicken Caesar. The poisson cru (raw tuna in coconut sauce) was fun. There was also a French dining restaurant open nightly, but it was way too expensive for us. We went al la carte instead of the all inclusive price of $129 US per person per day. Some packages included the breakfast buffet and we saw many tourists trying to make this their biggest meal of the day. To save money on meals at the InterContinental Moorea, walk 20 minutes left to the restaurant named Mahana. This is a popular cash only spot that serves from 11am to 3pm. They have tuna, mahi mahi, chicken and burgers. Quality is ok and prices are about 25% less than at the hotel. Alternately walk about 30 minutes right to the small village of Hauru and you’ll come upon three options in the small town of Hanua. We enjoyed Le Motu. The served hamburger, fries and a pop for $11.50 which is half the price of the hotel. I added a sugar crepe and a scoop of vanilla ice cream for dessert for $4. Desserts at the hotel started at $11. It’s a great option for saving money and for walking off the fries and ice cream. 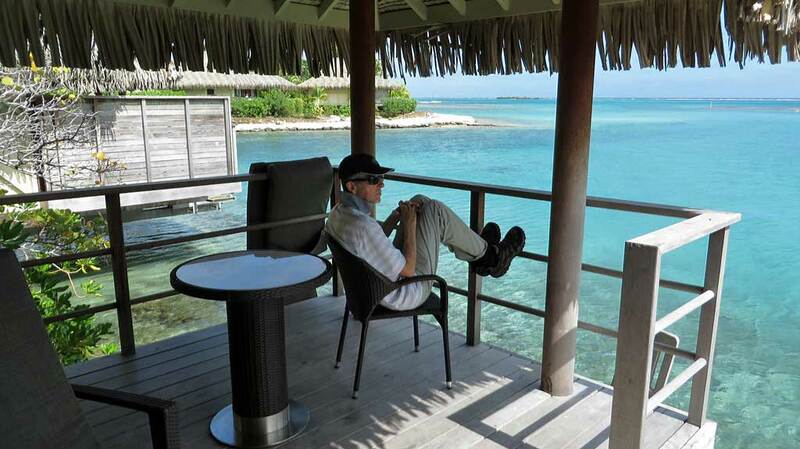 In all my travels, I don’t think I’ve enjoyed a stay more than I did at anInterContinental Moorea overwater bungalow. I’d also consider one of their beachfront bungalows in future. They offer comparable luxury at a discounted price. I can’t wait to get back to Moorea and also try some other French Polynesian islands too.